Then & Wow: In its second decade, Martine is hitting its stride. I first reviewed Euro-style Martine bistro back in the winter of 1999. Wow, time flies. On one hand, it’s hard for me to believe that Martine has been around for this long. On the other, it totally makes sense that Martine is still alive and kicking into its second decade. This charming, independent restaurant quietly—without a lot of fanfare or press—continues to entice customers old and new with its lovely ambiance, friendly and professional service and dishes that please. And, while now it’s de rigueur, you might recall that in 1999 nobody in town except Café Madrid was doing tapas or small-plate dining. Martine was the first to introduce the small-plate concept to Salt Lake City. Eventually, restaurants like Zola, Meditrina, Pago, Moxi and others would follow suit, but Martine broke that ground. A server during a recent dinner—whose name I unfortunately forgot to note—has been with Martine since its inception. That’s nearly unheard of in the restaurant biz. I’d forgotten my reading glasses, and the restaurant’s dim lighting and small-print menu made me wish I’d brought a miner’s headlamp and magnifying glass. I literally couldn’t begin to read the menu. Thankfully, though, our friendly, longtime Martine server came to the rescue with some loaner glasses. This is a simple act of service kindness that I recommend to every restaurateur, big or small: Buy a couple of pairs of inexpensive reading glasses and keep them on hand for poor-sighted customers like me, who continually lose, forget or misplace glasses. So, now able to actually read the menu, I went forth, tempted by so many enticing tapas and entrées. A must-have tapa at Martine is chef Tom Grant’s stupendous Moroccan braised beef with gingered couscous ($9). Grant, an owner/partner at Martine along with Scott Hale, has also been with the eatery since its genesis. This dish—fragrant with Moroccan spices—was featured a few years ago in Bon Appétit and the tender, luscious beef was every bit as wonderful as I’d remembered from earlier visits. My only complaint is that it isn’t offered as an entrée; more is better, in this case. Grant’s Woodland mushroom ragout, which comes with a spring pea risotto cake ($10), is also spot-on. And, I can highly recommend his pan-seared bay scallops with blood orange-coriander jus and perfectly cooked black lentils ($10), as well. In fact, the only appetizer/tapas/small plate I found less than superb was grilled white asparagus with balsamic Crimini mushrooms and shaved Manchego cheese ($9). The grilled asparagus spears were criminally tough and stringy. Looking back at my first Martine review, I see that I didn’t care much for the cassoulet: “No sausage, no confit, no pork,” said I, in ’99. Well, today’s cassoulet ($19) rocks. It’s an entrée-size portion of braised Creminelli sausage, rabbit confit and ham hocks with white beans and a beautiful, crunchy breadcrumb crust, all rich and wintry tasting. If you like this sort of thing, you might want to hurry in, since I wouldn’t be surprised to see it disappear from the menu in warmer weather. Ditto the hearty, braised Morgan Valley Lamb shank with French lentils and Bordelaise ($24). I really liked the overall flavor is this “Bistro Dish,” but found it a bit too brothy—more akin to a soup or stew than a braised shank with sauce. 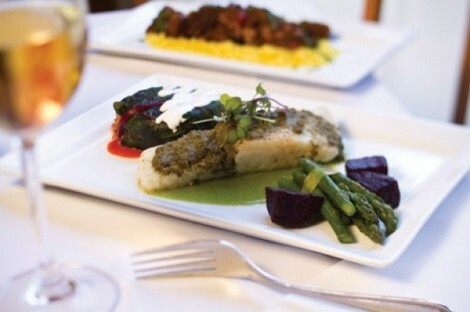 A dish more apropos of the season is the caper and mint-crusted halibut, which comes with a timbale of orzo, feta cheese and nicoise olives ($32). If mint is your thing, you’ll love this dish. If not, don’t go near it, because it’s really minty. One of the understated attractions of Martine is the wine list. It’s not the biggest, but it might be one of the best. Owner Hale has a fetish for finding interesting, inexpensive wines and then not pricing the bejeesus out of them. And so, you might sip a glass of Bodegas Godeval Valdeorras ($10/glass) as you nibble on the gratis marinated olives and Crumb Brother’s bread that comes to your table. Or, you might opt for a fairly priced bottle ($38) of Clos la Coutale Cahors 2007 (90 points in Wine Spectator), which is a perfect partner for the aforementioned cassoulet and braised lamb, not to mention the pink peppercorn-seared beef tenderloin with morel mushroom-brandy cream. And, as Virginia Rainey pointed out in a Second Helping column (“A Decade of Martine,” Dec. 24, 2009, City Weekly, ), the new curved bar at Martine is a terrific place to drop in to dine alone, with friends or with a date. She says, “A handful of barstools look into a gorgeous old brass-trimmed bank vault, but the feeling is open and friendly and conversation flows, with other diners as well as the staff.” Classic jazz wafts through the air at this pretty brownstone restaurant, where tables are festooned with small candles and fresh-cut roses, and where romance always seems a distinct possibility. Whenever a cheese plate is an option, I usually eschew dessert for fromage. And, on my first recent dinner visit to Martine, I did enjoy a plate of Spanish “drunken” (soaked in wine) goat cheese, Cambozola, Bleu d’Auvergne and Saint Pauline cheeses. However, on a follow-up visit, I couldn’t resist Chef Grant’s blood-orange panna cotta, which comes with an outrageously delicious orange and tart cherry marmalade ($7). Even if you choose to dine somewhere else in the neighborhood, do yourself a favor and stop in to Martine for this delectable dessert. And, if you’re still not quite tempted, here’s one more reason to consider Martine: There’s now valet parking for $5, right smack in front of the restaurant. So, no more excuses for not visiting this decade-old eatery, which is just now hitting its stride.